2013 TTSE "The Silver Streak"
BIKE IS NO LONGER BEING OFFERED FOR SALE. UNABLE TO DELETE THE POST. I am [NOT] selling my silver 2013 Trophy SE due to a serious change in my health status. Bike is located in Long Beach, CA 90808 USA. It has just over 20,000 miles on it. I purchased it from Triumph-Ducati of Newport Beach and they performed the 20,000-mile service. It has the panniers and top case, all with liners, and a heated Corbin saddle. The stock saddle and passenger seat will go with the bike. I added a Trident oval carbon fiber exhaust that looks and sounds great. The stock exhaust also goes with the bike. It has the mount for the Garmin GPS. There is an aftermarket loud horn (Fiamm, I think). Everything works. Tires are good Michelin Pilots. It has fresh fill of Amsoil in the engine and final drive. Sale includes a cover and battery maintainer. Dealertool optional at extra cost. Will not sell separately unless bike sells first w/o Dealertool. If the bike sells without the dealertool, please let me know. Hoping your health doesn't further decline and stay safe. Howdy neighbor, I too live in LGB. Just wondering about your change of mind. 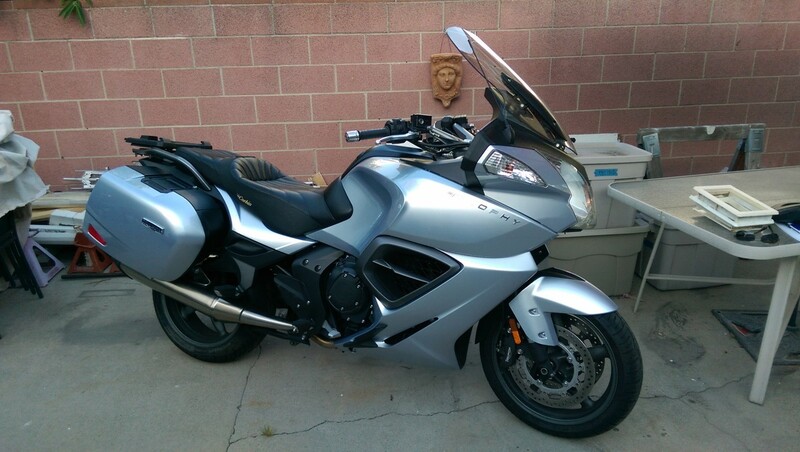 I have a BMW R1200RT '05 and always wondered about these Trophies. Bike no longer for sale - Topic Locked.